From the warped and creative minds of the Blogosphere’s most talented writers comes a retelling of classic fables and fairy tales, each one more twisted than the last. F*cked Up Fairy Tales is childhood as you never remembered it. Every author who participates in the project wins a spot on THE BLOGGER COLLECTIVE page (presently under construction) with links back to his/her blog of choice. There are also weekly interviews planned if you choose to participate. 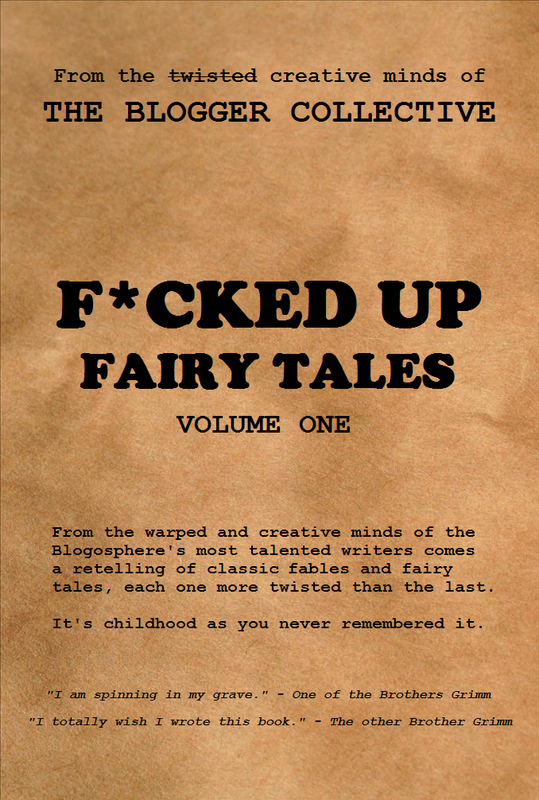 But best of all, 100% of the profits from F*CKED UP FAIRY TALES are donated to charity (more info to come). Check out our list of contributors below. If you’d like become part of THE BLOGGER COLLECTIVE contact us at heellisgoa (at) gmail (dot) com with your story idea. Interesting . . . Lay the Ugly Ducking on me! A spring 2013 deadline fits in perfectly with my procrastinating personality. Ugly Duckling it is! Thanks! As a fellow lover of all things dark and spooky, feel free to take this anywhere you want to go with it. I’m sincerely hoping at least one of these stories is all sick and twisted. I already have an idea for the tale, and yeah, I think it’ll be twisted. PERFECT. The darker and more twisted, the better. I saw! I think I left the same comment on Sight’s blog. I need to hop over there and give him a link to this page. You should do Elves, Archon! I bet you could make it a timely allegory on the Canadian health care system. There’s a hidden Orwell in you, I know it! Rumplestiltskin is all yours, buddy! Since I am a tiny woman, I’ll take on Thumbelina, but not in a cage fight. I’ll simply retell her tale. I don’t know much about Thumbelina except that she was/is tiny. Wikipedia mentions cockchafers. I don’t know what they are either, but it sounds like the kind of made up word I might use. COCKCHAFERS?!?! HOW HAVE I NEVER HEARD OF THIS WORD??? Yes, you are definitely down for Thumbelina! Is “The Snow Queen” still available? If so, I’ll take it. Yes, you write your own take on the story THREE BILLY GOATS GRUFF. It can be funny or sad or dark or whatever. I’d like to keep it at 5000 words or less, if possible. I am also shooting for an April 2013 deadline. Think it over. I bet you could have fun with it! I need your email addy so I can send you what I have. hi just found your blog via a blog friend…and might take on the challenge of 3 Billy goats gruff…what’s your deadline? I did a Rapunzel story last year (its on my blog in the pages under my header, should you choose to take a glance at it)….but no holds barred…? I love challenges like that! This sounds really cool. I read both Edward Hotspur and Doggy’s Style’s blogs and found you through them. This is a great project. So are you still taking submissions? I’ll have to see what fairy tales are left! All the above fairy tales are taken, but I am sure there are either some that I missed or fables that can be twisted. I will do some looking and let you know. If you find one first just drop me a comment here! I have a title, and it’s on the the page. Thanks so much! I know it will be amazing! mwhahahhahaha…fastpass to hell…that made me almost snort tea out my nose! thanks! I’m hoping to proof this weekend when my kids are out of the house and I can think. Would love to do Pinocchio if it is still available!? I’ll take the Princess and the Pea!! Haha….that just made me choke on my wine!! Yeah, that’s El Guapo grade esoteric. Love it….and Guapo. Now that song is playing in my head. 🙂 You’ll love me even more after that poor princess story meets macabre and twisted. Hey Hellis….just want to make sure you got my email with my take on the Princess and the Pea. I don’t want to miss the deadline!! Thanks. Hi. Can I come on board? What’s available? I’ll pencil you in for Jack and the Beanstalk. Let’s see what you can do with that, Tanker. Jesus Christ. Why would you let THIS guy write ANYTHING?